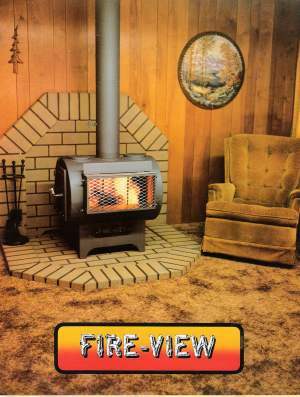 The first freestanding, wood-burning heater with a window. If you would like Operating and Installation instructions and a copy of the UL Listing label I can email a pdf to you. See Contact page for contact information. This is an aerial view of the property in the 1980’s. The original piece was 220 acres. The log house, where Gianaclis and her sister grew up was one of three homestead cabins on the property. Bob and Joan bought the land in the late 1940’s. When they moved back to the property in 1961 (after becoming chiropractors) they built a sawmill to mill their own lumber, had a large organic garden and built a barn and pasture for a milk cow. (Buttercup). 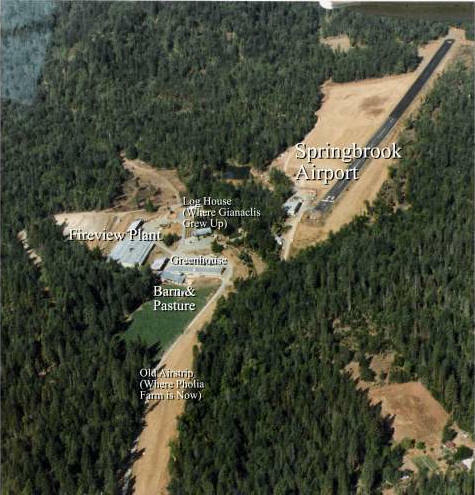 The pasture was irrigated from two creeks that fed a large pond (to the left of the runway) which is also used by the forest service for fire control. The dirt airstrip (where Pholia Farm sits now) was built in the 1970’s. 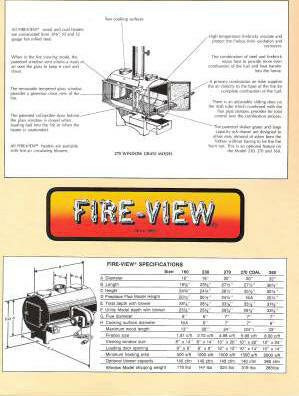 Fire-View Wood heaters came about after the family struggled to keep warm in the log house for several winters. Bob came up with a patented design for a stove that would provide a maximum amount of heat and with a window that would stay clean for extended periods of time. At its peak, Fire-View employed 120 people at the Springbrook plant and shipped all over the United States. Many are still in use today, including at Pholia Farm where our unit holds a fire for 12-14 hours without a problem. A few people found the Fire-View aesthetically unpleasing- except those of us who found it beautiful because of the amazing job it did keeping us warm. My dad was always about form that fitted function- if it worked well, then it looked as it should. 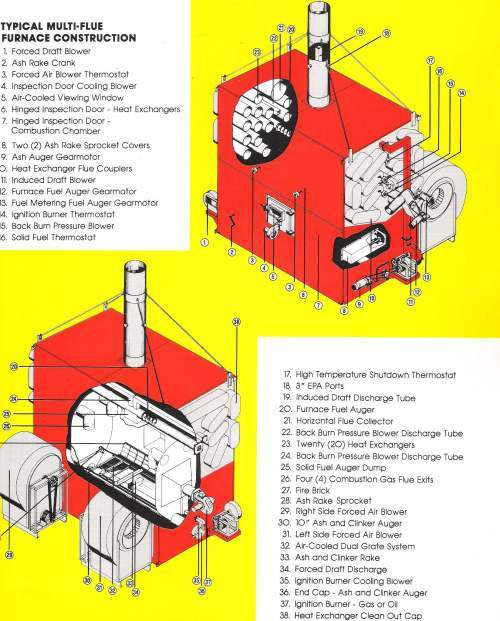 One of the other patented inventions of my Dad- a multi fuel furnace. 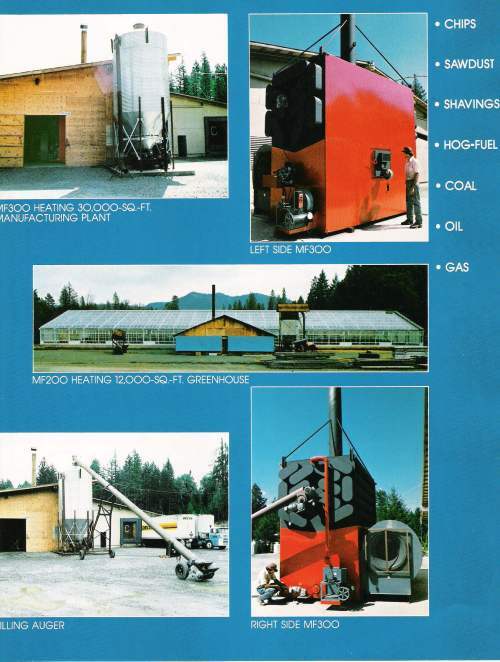 These units heated the Fire-View Manufacturing plant (30,000 sq ft), the 12,000 sq ft greenhouse on the property, as well as were shipped to Hawaii for use by one of the coffee roasting companies. The greenhouse (disassembled by just my mom and dad in the 1950’s in Los Angeles and moved to Springbrook) was finally put back together and in operation in the 1980’s (Vern worked on it as a young guy after school). My dad and his 2nd wife, Kathy, grew hydroponic tomatoes in it.